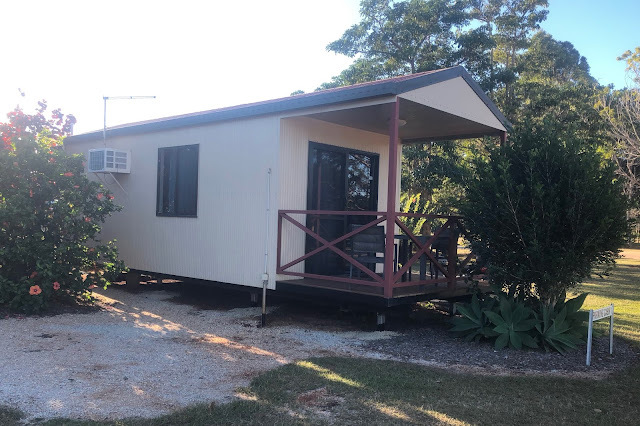 This will be my home for at least a week because when I went to the RACQ depot this morning they told me they were so busy they couldn't look at Yemmy until next Monday! They just may get a chance before then but couldn't guarantee it. The RACV has agreed to pay for me to stay in this cabin until next week and I could get a hire car if I wanted. With so many people here keen to help me it doesn't seem necessary - Graham took me to Mareeba this morning so I collected a lot of things I had forgotten yesterday. Today I'd made a list! The cabin is very well equipped and tonight I used the microwave to cook some chicken drumsticks. The shower is great and so convenient because I don't have to go over to the camp conveniences. I registered 3,682 steps today but I forgot to take my phone to happy hour so missed quite a few steps.